As the power of the cloud becomes more widely used throughout the geospatial industry, more and more companies are offering services, both free and paid for, that can enhance your company’s GIS capabilities. Many of these services come in the form of Image Services or Application Programming Interfaces (API’s). According to Wikipedia, an API is a specification intended to be used as an interface by software components to communicate with each other. An API may include specifications for routines, data structures, object classes, and variables. In the geospatial industry, API’s are most often used for querying data and functionality to be used in your own application. 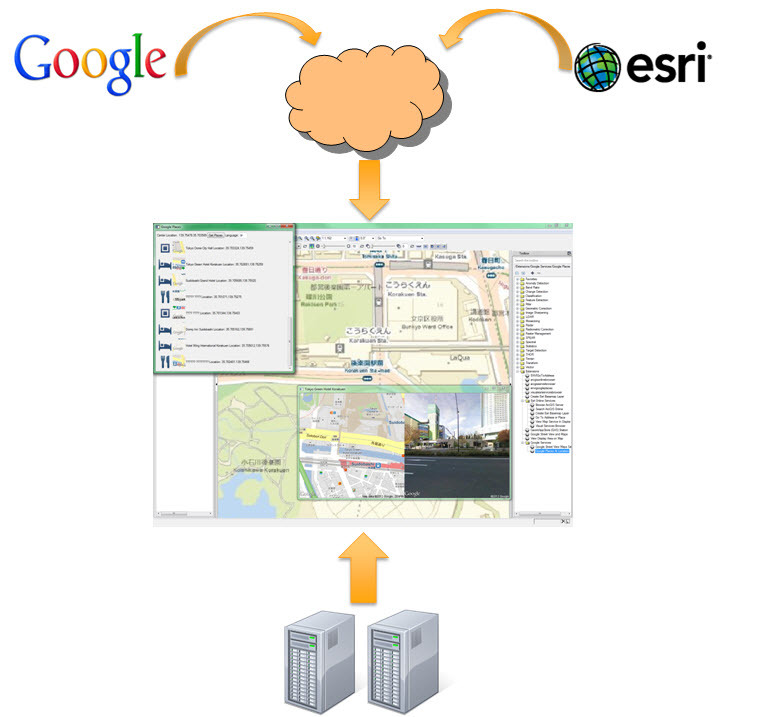 Two of the major players in the geospatial industry, Esri® and Google®, have recently released online services for consumption by the marketplace. Esri® recently released the entire LandSat data archives as an image service which is free of charge to its users. This feed is great in that it not only allows folks to quickly add free imagery into their maps and applications, it also allows for querying and running analysis on the data as well. Esri®’s Open Geoservices REST Specification allows for this service to be called utilizing HTTP REST calls, which are quickly becoming the standard for interoperability between web components. This means that you can call these services from any IT infrastructure without requiring install of specific programs or libraries. The Google® Places API: allows you to embed the ability query businesses or points of interest within your map view. The Google®Earth API: allows you to embed Google® Earth into your webpage. The Google® Elevation API: allows you to search and discover elevation data across the globe and calculate distances based on elevation changes. Each of these API’s provides advanced functionality that can be very easily embedded into any application. While Google® does charge a fee for the use of these services, the data availability, advanced functionality, consistent up-time, and frankly the convenient look and feel of Google applications is well worth the investment, particularly if you are simply using these services as contextual background for your larger business messaging. What geospatial API’s have you used in the past? Do you think geospatial API’s are growing in popularity or are they becoming a thing of the past?